Almost two million BBC radio podcasts were downloaded during December, with the corporation's breakfast programmes the most popular with listeners. 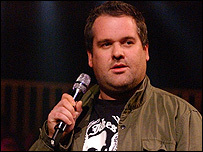 Radio 1's Chris Moyles topped the chart with his show downloaded 446,809 times. Radio 4's Today came in second place. Mark Kermode's film reviews from Five Live and Chris Evans' Best Bits from Radio 2 were also in the top 10. Podcasting allows users to subscribe to audio or visual material for playing on a computer or portable device. The Best of Moyles mp3 - a 20-minute broadcast featuring speech highlights from the week - was boosted by daily podcasts when the show was in New York. Moyles said: "I'm very pleased we're number one and that people are making an effort to listen to the show even if they can't be bothered to get up early to hear us." BBC Radio 4 has a strong presence in the chart, with the Today programme's daily 0810GMT interview receiving 413,492 downloads in the month, while From Our Own Correspondent and In Our Time both performed well. Simon Nelson, Controller of BBC Radio & Music Interactive, said: "It's fantastic to see how the demand for radio downloads has grown since we first offered them in 2004. "These figures underline the enduring relevance of radio in the digital world." Twenty programmes were made available in BBC Radio's download and podcast trial last May. At the end of 2005 it was announced that the trial would be extended into this year and would include more programmes.